CHC’s first flight for the initial phase of Ørsted’s Hornsea Project One offshore wind farm left Humberside Airport at 11:15 am local time Wednesday morning. Hornsea Project One will be the biggest wind farm in the world, capable of supplying clean electricity to over one million homes. It will be built 120km off the coast of Yorkshire, UK, and helicopters will be used to transport workers and equipment both during the construction and operational phases. CHC is a leading provider in the oil and gas industry. Working with Uni-Fly, CHC will deliver the six -year deal covering the construction phase as well as the first five years of operations and maintenance of the wind farm. This includes a transfer service to take people from shore to the wind farm, and also smaller helicopters to transfer people and tools between the turbines and substations. 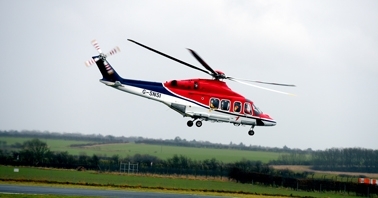 A combination of Leonardo AW139 and AW169 helicopters will begin flying out of Humberside heliport from April 2018 to support the construction and support phases of the project. Both the services and operations for this contract will be based from Humberside, contributing to the expansion and development of the service base and surrounding area. CHC’s Regional Director for Europe, Middle East and Africa, Mark Abbey said: “I am delighted to see our service get underway. It is a privilege to be part of this landmark project. Duncan Clark, Hornsea Project One Programme Director, said: “This is the first ever wind farm in the world to be built at this scale, and it’s bringing great benefits to the UK and the Humber region.